On August 1, 2018, a new state law targeting anti-pipeline protesters went into effect in Louisiana. The law declares pipelines and associated work equipment to be “critical infrastructure” along with water treatment plants and the power grid and makes trespassing on pipeline construction sites a serious crime, even if these sites are on private land where the landowners have given permission for people to gather. “Disrupting” a pipeline’s “operations” could land you in prison for up to 20 years. The law is clearly aimed at the Water Protectors in Louisiana, many of whom are part of local indigenous communities, who routinely bring construction of the Bayou Bridge Pipeline to a temporary halt with colorful — and peaceful — acts of civil disobedience. The law essentially repeals the First Amendment, which guarantees American citizens the right of peaceful assembly. In April 2018, state representative Major Thibaut (D, LA18, New Roads), introduced HB 727, a bill titled “Provides relative to unauthorized entry of and criminal damage to a critical infrastructure.” The bill was cosponsored overwhelmingly by Republican lawmakers, but also by Democratic state representatives John Anders (LA-21, Vidalia), Robert Billiot (LA-83, Westwego), Mike Danahay (LA-33, Sulphur), Bernard LeBas (LA-38, Ville Platte), Barbara Norton (LA-03, Shreveport), and state senators Gerald Boudreaux (LA-24, Lafayette), Eric LaFleur (LA-28, Ville Platte), and Francis Thompson (LA-34, Delhi). In May 2018, the finalized bill and amendments changing the language to further specify critical infrastructure, passed the state senate with a 31-4 vote (another 4 senators were absent), and then passed the state house with a 88-1 vote (15 representatives were absent). The legislation was supported and pushed by ALEC, the American Legislative Exchange Council. Through ALEC, corporations hand state legislators their wishlists to benefit their bottom line. Corporations fund almost all of ALEC’s operations. They pay for a seat on ALEC task forces where corporate lobbyists and special interest reps vote with elected officials to approve “model” legislation, one of which titled “The Critical Infrastructure Protection Act” has been used to write state legislation around the country, including Louisiana’s HB 727. A quick look at the donor lists of Louisiana state legislators shows a lot of campaign money coming from the same corporations that partner with ALEC, including Koch Industries and big oil and natural gas companies. Corporations that stand to make a huge profit off of these sorts of pipelines, at the expense of our local people and wildlife, have bought influence within our state legislature, giving them a voice much louder than the actual citizens. HB 727 is the sort of legislation that keeps corporate interests happy, and keep donations and other perks flowing to state lawmakers. It was signed into law by Democratic governor John Bel Edwards, who has supported ALEC-engineered Right Wing legislation for years, and recently addressed an ALEC conference in New Orleans. This law directly impacts indigenous water protectors fighting the Bayou Bridge Pipeline, a crude oil pipeline being built by Energy Transfer Partners through our Atchafalaya Basin. The pipeline is being built across 170 miles of Southeast Louisiana, including the Atchafalaya Basin, America’s largest river basin swamp. The pipeline will directly impact 600 acres of Louisiana’s disappearing wetlands, threaten nearly 700 waterbodies, and jeopardize the drinking water sources of over 300,000 people. and will have serious, unintended consequences for Louisiana landowners, fishers and hunters. Energy Transfer Partners has a horrible track record, with its pipelines spilling once every 11 days, on average. ETP was brought into the spotlight due to its Dakota Access Pipeline which was opposed by the indigenous communities whose land and water it threatened. The Dakota Access Pipeline spilled 4 times in 2017. This bill would have made the Standing Rock protests largely illegal. It was warned this legislation would have drastic consequences for all Louisiana citizens. There are thousands of miles of pipelines cross-cutting Louisiana’s wetlands, private property, and public waterways. Fishers and farmers cross industry pipelines on a daily basis – this legislation puts them at risk of felony conviction for simple trespass. Landowners who have had property expropriated through eminent domain could unintentionally damage a pipeline on their private property and risk a felony conviction. These harsh punishments put everyday Louisianans at risk of serious, life-altering charges. The responsibility of our state legislators is to protect the interests and freedoms of their constituents, not corporations. Water protectors engaging in peaceful protest, as well as members of the press, have not only been arrested, but have been physically assaulted by police and private security, most recently on private land in St Martinville Parish where they were given permission to protest by the land owner. This is an assault on our civil liberties, our environment, and our faith in our government as representative of the people. What Louisiana needs, now more than ever, is a new crop of state legislators. People with integrity and heart, who are uncorrupted by corporate influence. People who put the interests of the community and the environment above the apathetic capitalist machinations of organizations like ALEC and the corporations and lawmakers who benefit from them. I have detailed previously the process of running for state legislature. How average citizens can take back our state government from the greedy privileged few. It’s not enough to simply flip the state blue. We must swing it to the Left. We must eradicate the corporate stranglehold on our beloved state. We can fix this. We MUST fix this. So that future generations may be able to enjoy the natural beauty of Louisiana without the shadow of greed and corruption lingering over them. I heard that a lot growing up. But despite those naysayers, I have been pleasantly surprised to watch as several states decriminalized marijuana, boosting their economies and putting to rest much of the stigma surrounding the plant and it’s use. This is progress long overdue, but still moving along much too slow. Do you want to know why marijuana is unlikely to be legalized in Louisiana anytime soon? Because our elected officials in the state legislature are bought off. A vast majority of those serving in the Louisiana state house and senate receive contributions from the pharmaceutical industry. An industry that makes a lot of money off of medical marijuana. Most of the same elected officials who fight back against any attempts to legalize recreational marijuana, vote in favor of medical marijuana legislation. Because it helps their donors. And keeps our jail cells full of people who can’t afford to make bail, which puts their jobs and personal lives in danger. So how do we get these officials to stop accepting corporate money from the pharmaceutical industry? Short answer, we can’t. But there is something we CAN do: Run for office and replace them. In November 2019, we have the opportunity to flip the script, and take our state legislature away from corporate interests. If enough of us run for office, on a vow to not accept corporate contributions, and a promise to support marijuana decriminalization, I firmly believe we can win and change the social and economic landscape of our state for the next four years. In February of 2018, Louisiana State Representative Edmond Jordan, a Democrat representing State House District 29 in Baton Rouge, introduced a bill (HB 274) which would have decriminalized marijuana in Louisiana. The bill went nowhere, because no one wanted it to go anywhere. It was effectively shelved. If enough pro-legalization candidates can win seats in 2019, we can not only bring this bill to the floor for a vote, but we can make sure it continues on to become law. So what can YOU do to make a difference? YOU CAN RUN. Have you ever heard of people discouraged from running for office simply because someone told them they aren’t qualified. That they aren’t wealthy, or connected in very particular social circles? Well that is just ridiculous. Do you want to know the qualifications for running for Louisiana State Legislature? 1. Are you 18 or older? 2. Have you lived at the same address (or within the same district) for at least a year? And have you lived in Louisiana at least two years? That’s all. That is the entirety of qualifications for becoming a state legislator in Louisiana. So, why don’t more ordinary people run for office? Part of the reason many people feel discouraged to run for state legislature is the low pay of the position. Louisiana state legislators receive an annual salary of $16,800 a year, plus a $6,000 a year expense allowance. They also receive $156 per day when traveling to the state capitol or elsewhere for legislative matters, or when traveling for official conferences or events. All in all, this amounts to the pay expected of a rather low paying job. Which is why the majority of lawmakers in our state are either older, retired individuals, people who are independently wealthy, or people with other careers as lawyers or doctors. This seemingly exclusive establishment benefits from common, everyday people deciding not to pursue a campaign for office. These people keep their positions of power, and pass laws to benefit themselves and their wealthy friends and supporters. Another reason people feel discouraged is the overwhelming idea that you must be able to raise a ton of money to run a campaign for office. Many people will tell you that it takes big money to run for office. And for decades, that has been true. Politicians have become accustomed to raising hundreds of thousands of dollars from wealthy donors seeking to influence laws in our state. The money gets spent on nice suits, fancy campaign signs, TV and radio commercials, etc. It usually becomes a race to see who can raise more money. And that sort of thinking needs to stop. Money doesn’t vote on election day. Candidate yard signs and t-shirts don’t vote on election day. PEOPLE vote on election day. And all you have to do is get your message, and your name, to those voters in your district. This will include spending a few hundred dollars on a voter list, and finding friends and family who will volunteer for your campaign. Spend several months prior to election day going to public events to meet people. Go to your local city council meetings, sporting events, art shows, concerts, carnivals. Anywhere there is sure to be a large number of people who live in your district. Print up some flyers, with your photo and a short biography explaining why you are running and what you stand for. Give those flyers to everyone you meet. Make a Facebook page for your campaign, and invite everyone to Like it and follow along on your journey. It may seem overwhelming at first, and many people will attempt to talk you out of it. They will say you aren’t the sort of person who runs for office. Not the sort of person who wins. Just smile, thank them for their opinion, and PROVE THEM WRONG. There are some costs to running for office, however. If you want to run for State Representative, you will be required to pay $225.00 to get your name on the ballot. If you want to run as a Democrat or Republican, there is a fee of $112.50 each to both the state and your local parish offices of whatever party you register as. In total, $450 will get you on the ballot. If you are running as an independent or third party, all you need is that initial $225.00. If you want to avoid that initial fee, then you can download a petition, and gather 400 signatures of registered voters in your district. Then all you have to pay are the fees to the party you choose. If you want to run for State Senate, you will be required to pay $300.00 to get your name on the ballot. If you want to run as a Democrat or Republican, there is a fee of $150.00 each to both the state and your local parish offices of whatever party you register as. In total, $600 will get you on the ballot. If you are running as an independent or third party, all you need is that initial $300.00. If you want to avoid that initial fee, then you can download a petition, and gather 500 signatures of registered voters in your district. Then all you have to pay are the fees to the party you choose. Of course if you have the desire to raise more money, to spend on bumper stickers, yard signs, or whatever you want to help your campaign, that is fine. Ask for donations from family and friends, raise money online, hold a BBQ fundraiser, whatever you want! Just please don’t accept anything from corporate entities. You don’t want to be tempted to sell out on your principles. You should want to run a campaign free from corruption. Otherwise, the sky is the limit, so do what feels most comfortable for you. You CAN do this. We all can. Those in power know that, and want to stop us from taking all the control away from them. Look up your State Representative and State Senator. Look them all up, and you will notice a trend among many of them. The vast majority of our elected officials are older, wealthy, straight white men. The pay for serving in office if you win is pretty low. You will make about $20,000 a year. This low wage keeps the average citizen from considering to run, and allows the independently wealthy to stay in power. They don’t need that money. They have plenty. And get plenty more from their corporate friends. They think they have the whole game rigged. PROVE THEM WRONG. Run for office. When you win, treat it as a second part-time job. You can still work your regular job, or continue going to school, or whatever it is you currently do, as long as you aren’t using the elected position to help your business. Being in office opens a lot of doors to a lot of opportunities. You will meet a lot of very interesting people. Some good, some not so much. And you will be working to make a real difference in our state. And setting a new standard that says that all of us are capable of running for office, winning, and serving the greater good. And that includes legalizing marijuana. Or increasing funding for education and healthcare. Or supporting legislation to help the homeless. To help veterans. To fight for higher wages. To save our deteriorating coastline. To fix our roads. To make our criminal justice system truly fair. Obviously, this is about more than just marijuana. It’s about real progress for everyone. There really is no excuse for so many people to sit on the sidelines, watching as a minority of wealthy individuals pass laws to benefit themselves and their even wealthier donors, all at our expense. I am asking you to take that bold step into a better future for us all. To help get you started, first visit http://www.geauxvote.com and click on Voter Registration Information, then Search By Voter. Type in your name, zip code, and birth month/year, then under Quick Links click on My Districts. There you will find all the different districts you are registered to vote in. You will see Senate (mine is 27) and Representative (mine is 33). Write those down. You can find who currently holds those seats on the GeauxVote site, or you head over to house.louisiana.gov or senate.louisiana.gov to find out more about your current state legislators and whether or not they stand for the same principles as you. So what are you waiting for? Get your name out there. Get your message out there. Let us all help each other take our state back from the wealthy, power-hungry corporations. Put Louisiana back into the hands of the people. © 2018 Charles Metcalf Jr. All Rights Reserved. Apologies to Richard Linklater, Matthew McConaughey, and Rory Cochrane for the rather ridiculous meme. You just gotta keep livin, man. L-I-V-I-N.
On Saturday, August 18, 2018, the Louisiana Democratic State Central Committee met in the state House chamber in Baton Rouge to vote on candidate endorsements and resolutions. It was a proud moment for me, as my first resolution to the state party was introduced, voted on, and passed unanimously. For some time now, I have been disgusted by the actions of our government in regards to the treatment of immigrants at our southern border. Day after day, we see stories of children separated from their families, many never being reunited again. It’s disappointing and embarrassing, the depths to which our society has morally sunk. While there is little any of us can do individually to rectify this problem, I did the one thing within my power. I wrote “A Resolution In Support Of Keeping Migrant Families Together” which did more than just address the separation issue. I wanted to fully condemn the inhumane treatment of immigrants seeking refuge and asylum in our country, a policy which is a slap in the face of our Statue of Liberty and the welcoming words inscribed with her. The passing of this resolution means it is an official position of the Louisiana Democratic Party. While individual office holders are free to treat the issue however they see fit (or however their donors see fit, in many circumstances), I feel it is nonetheless a small victory for human rights. I will continue to bring this issue to the attention of my local lawmakers, in hopes they will support a change to the larger policy. CLICK HERE to read the full text of my resolution. It is MLK Day, a day of remembrance for a great man and his outstanding contributions to civil rights for people of all races, religions, and lifestyles. Absolutely one of the most important people who lived in the last 100 years. What can I say about Dr. Martin Luther King Jr that hasn’t been said before.. An imperfect man, who still managed to help pull a downtrodden segment of society out of disenfranchisement, fighting against a furious breed of racial hatred, and in doing so not only set an example for the world to aspire to, but also became a martyr for equality. This man may not have single-handedly defeated racial inequality, but he succeeded in opening many eyes to the truth of the terrible matter. Ever since I was a kid, Martin Luther King Jr Day has been negatively referred to as a “black holiday.” Calling it that belittles the work this exceptional man did in his life. The man was a true Civil Rights leader, for everyone, regardless of race, gender, religion, or social status. He was a deeply flawed human, like the rest of us, who tried his hardest to work past that, to work past the negativity and injustice he saw in this world. We ALL should be proud of what he accomplished, what he died for trying to accomplish. Take a certain photo for example. 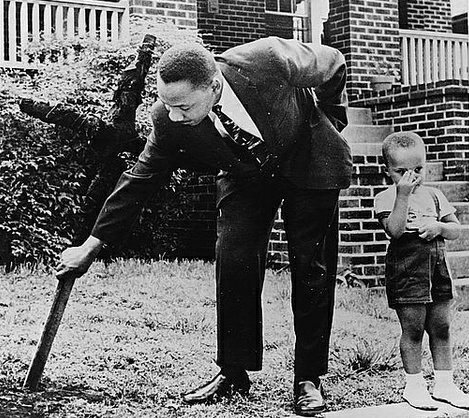 Dr. King removing a burnt cross from his lawn while his son stands nearby. I’m heartbroken by the circumstances that must have led to this moment, but the look on Dr. King’s face, like he’s just simply pulling a bothersome weed. That is strength, my friends. Dr. King’s legacy is one that we should all strive to live up to, not just today, but every day. I’d love to know his thoughts on how our society has grown since his time. But, even more, I’d like to know his thoughts on how our society has not. Due to personal concerns and circumstances, I am reluctantly suspending my campaign for US Representative in Louisiana’s 3rd Congressional District. Barring any changes in the near future, I would like to wish all the Democratic candidates good luck in their continued campaign to win the House seat from Rep. Clay Higgins. I find it quite troubling that our current military budget is well over $800 Billion, more than 8 times larger than the budget for the Department of Veterans Affairs for 2018. Our veterans inarguably deserve so much better than this. They have more than earned that. 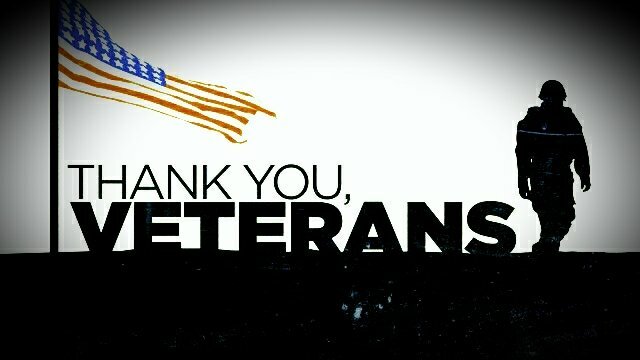 This Veterans Day, I salute the brave men and women who have fought for our country, and are likely fighting serious battles of their own, and I apologize, on behalf of our country, for failing far too many of them in their times of desperate need. Far too often, our leadership in Washington drops the ball when it comes to ensuring our veterans and active military personnel have real access to healthcare, including much needed mental health and addiction rehabilitation services. In fact, our current Republican-controlled Congress is moving forward with a budget that includes drastic cuts to VA programs, which will impact elderly and disabled veterans the most. This doesn’t even begin to take into account the tens of thousands of homeless veterans our leaders continue to leave out in the cold, year after year. We need representatives who will take the needs of our veterans to heart, and do something to help, instead of blocking these efforts in the name of fiscal responsibility. We need empathetic progressive voices in leadership to push for real changes that will positively impact everyone, including those heroic men and women who sacrifice so much for our comparably comfortable lives here at home. Our veterans should always be able to expect and rely on the real help and support they deserve, and together our society should work harder to make that happen. Happy Veterans Day to our veterans and their loved ones, and thank you all for your service. – Charles Metcalf Jr, candidate for US Representative, Louisiana 3rd Congressional District. Sulphur, Louisiana, October 31, 2017 – Charles Metcalf Jr has announced his campaign to run for Congress, as a US Representative in Louisiana’s 3rd Congressional District, in the 2018 election period. He will be running as a Democrat. An advocate for progressive social and economic causes, Mr. Metcalf’s campaign will target the specific needs of southwest Louisiana as well as issues facing the nation as a whole. The campaign looks forward to challenging the Congressional seat currently held by Rep. Clay Higgins (R). Interested parties can learn more by visiting the campaign website at Metcalf2018.com.